Enjoy the fantastic landscapes of Ireland’s north and west on atour packed with excursions. We visit the iconic Giant’s Causeway,the Connemara Coast and vibrant Dublin. Awash with locations thatcapture the essence of Ireland, this tour is a great place to startas a newcomer to the Emerald Isle. Departs from May 2017 to September 2017. Our holiday begins as we take the ferry across to Ireland,arriving in the port of Dublin. On arrival we transfer to our hotelon the outskirts of Dublin. We begin our exploration of Dublin this morning with a visit tothe Book of Kells exhibition, aided by our local guide. Our nextstop is the famous Guinness Storehouse, followed by an afternoon atleisure. Day 3 sees us transfer to Belfast, byfirst class rail where, after checking in to our hotel, we enjoy acity tour. Today we begin with a visit to Crumlin Road Gaol. Later weexplore the Titanic Museum. 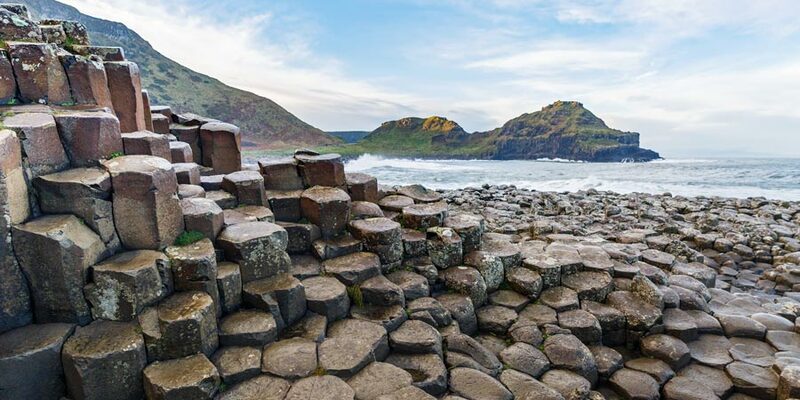 We enjoy a day’s coaching around the magnificent Causeway Coast,with the highlight of the trip the Giant’s Causeway, one ofEurope’s most photogenic landscapes. Today we visit the Bushmills Distillery, followed by time atDunluce Castle. Later we continue to Coleraine, before continuingon a wonderfully scenic rail journey to Derry and on to Donegaltown. We check into our hotel on arrival. We are treated once again today by Ireland’s magnificentlandscape, enjoying Slieve League, Glenveagh National Park and ajourney on through attractive scenery on the Fintown Railway (June& August departures only). The Connemara Coast enchants us today with its stunning fjordsand mountains. Later we visit Westport, where we have free time forlunch. Later we visit Kylemore Abbey. We enjoy a leisurely morning followed by rail to Dublin andtransfer to our hotel for the night. This evening we visit theMerry Ploughboys pub. Today we transfer to the port for our ferry home.